Yes, today I announce my service (actually my 1st service at fiverr). I will remove malware from wordpress blog for $5 inspired from my friend case who got her blog attacked by malware. An iframe stay at index.php and create temporary files. This files quickly fill hes webspace account and full message tell web support. 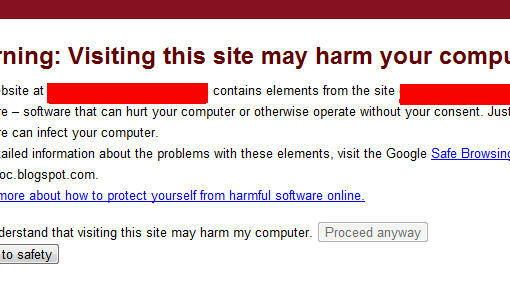 She got quota warning and chrome web browser displayed the famous attack message. After check the files and eliminate suspected file her blog got back to normal operation. I suggest her to change all password since that time. I ever face this case too (two years ago) and it make Google refuse to send me visitor. After realize that I got infected from network ads I remove the code and wait for all record and cache removed. Took 1 month to get all things get back to normal. Ok, guys. Beside remove malware from wordpress powered blog, what kind of service do you want me to provide?